A large diaphragm condenser with a performance that makes it worth the extra outlay. Natural sound quality. Low noise. Smart looks. JZ Microphones' range features several microphones based on classic designs. Neumann's U47 and U67 and the AKG C12 have all been re-imagined by the Latvian company and designer Juris Zarins. But the Vintage 11 is not based on any particular mic, instead being a new design that the company says follows vintage traditions and qualities - it's less expensive too. The 11, by the way, has nothing to do with Spinal Tap but is because the mic was designed in 2011. 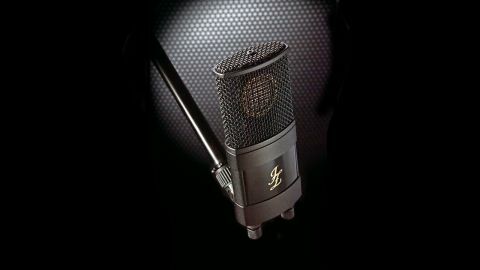 "The first thing of note is that the Vintage 11 is a very quiet mic, with little apparent in the way of self noise"
Smartly finished in black, the Vintage 11 has the same distinctive flattish shape as the rest of the Vintage series but comes with a different mounting mechanism. Where the other mics feature an integral ball and socket joint mounting that allows adjustment for a wide range of positioning, the 11 has a standard mount that allows 180 degrees of swivel and attaches to the main mic body via a pair of easily- turned knurled thumbscrews. A couple of rubber grommets sit in place between the mount and the mic body, providing a degree of isolation from any rumble transmitted through the mic stand, but it's not quite as effective as a full suspension cradle would be. This is a large diaphragm (27mm) condenser mic that is cardioid pattern only. The mic, like the rest of the Vintage series, uses class A discrete electronics and has its own unique capsule, in this case the GDC11, featuring a double diaphragm that utilises JZ's Golden Drop technology. This manufacturing process (where tiny golden dots are systematically sputtered on the diaphragm) results in a lighter, and hence faster moving, diaphragm which JZ say can detect and deliver much faster changes in musical content for more clarity, with less colouration and distortion. There are no extra switched facilities such as a hi-pass filter or pad, but the mic is quoted as being able to handle SPLs of 134dB. Plugging in and turning up the pre-amp gain, the first thing of note is that the Vintage 11 is a very quiet mic, with little apparent in the way of self noise. As for the actual sound, a noticeable characteristic is a lift in the frequency response down around the 100Hz region which imparts a velvety warmth that's well suited to the male voice, especially for spoken word work. While that low-end bump is quite strong, it doesn't get overbearing unless a vocalist gets really close in and, of course, it can be tamed with a little EQ. The midrange shows no obvious anomalies and the top-end could be described as smooth and natural as there's nothing overdone in that upper register, no designed-in presence peaks or excess of sizzle. The mic, in fact, delivered a good honest recording of the sung vocals that we put in front of it. In the course of our testing we were able to use the Vintage 11 on acoustic guitar, on percussion, for micing up a guitar amp and as a general ambient mic to capture the sound in the room. In all cases the mic did everything expected of it, instilling confidence that it would make a useful addition to any mic collection, as well as a good first large diaphragm condenser for anyone who could afford it. The 11 is a classy, smooth-sounding large diaphragm condenser that, besides doing a sterling job on vocal duties, is capable of a lot of other tasks where a natural sound is called for. What's more, it is good value for money - if you want to take a step beyond the glut of budget mics on the market but can't afford the more expensive names you will be getting a lot of microphone for a street price below £400.